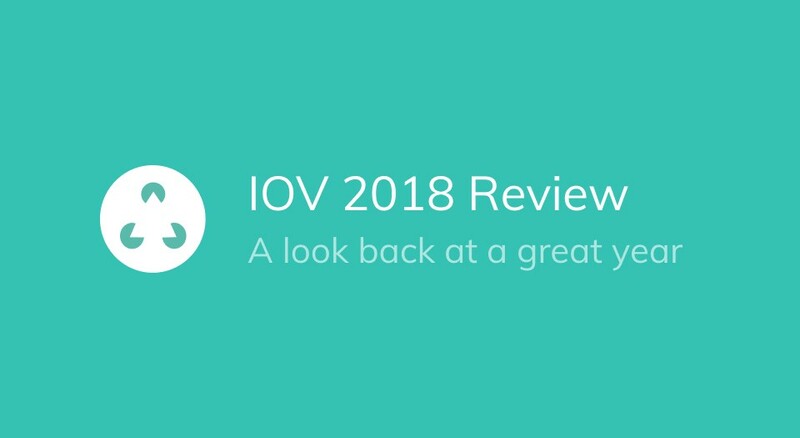 The year started off with our co-founders, Antoine Herzog, Karim Ganem and Isabella Dell, writing and publishing our technical whitepaper, which provided the initial scope and vision for the IOV project. Outlined in the paper was a vision for a unified, easy-to-use multi-chain blockchain ecosystem, and the tools needed to bring mass adoption to blockchain technology around the world. Quickly after publishing the whitepaper, we published our website (www.iov.one) and announced that we would launch a private token offering to fund the development of our key technologies; the Blockchain Communication Protocol (BCP), Blockchain Name Service (BNS) and the IOV wallet. Our key ideas of bringing a better user experience (through personalized human readable addresses) and unlocking interoperability (to exchange values across multiple blockchains) resonated with our community, and we were able to quickly reach our initial target of 4.3M EUR in token sales. This money has been enough to power the development of our technology and hire a team of over 30 people to deliver on the IOV vision. On May 24th, IOV took part in the TechCrunch Startup Battlefield Europe, in Paris. IOV qualified to the final round and came in as runner-up of the entire competition! See CTO Isabella Dell present IOV to the judges and answer their questions. Over the course of the year we developed IOV-Core, a public code library that allows developers to build multichain dapps easily. This repo provides core functionality to all clients in a cross-platform typescript library. This can be used to build cli/gui clients, automated scripts, or help build bcp-proxy apps. In October, IOV-Core began enabling cross-chain transactions between two Lisk-based blockchains, Lisk and Rise. The lead developer of Rise collaborated in the project by contributing a library to the IOV-Core. IOV’s first public testnet running on Tendermint launched on Friday, August 31st. Two versions were active in 2018: “Friend Net Fast,” which generated a new block every second, and “Friend Net Slow,” which only created a block when a transaction occurs. The “friendnets” ran on 4 Validator Nodes, 2+ Fullnodes for P2P, and 2–15 RPC Fullnodes. They provided a wallet ready blockchain network, a faucet integrated into the wallet, and a PEX Service to share node_id and IP. We learned a lot from these initial “friendnets” as they provided us with key insights that have allowed us to make significant improvements to our IOV-Core library. As of this week, we’ve closed both “friendnets” in anticipation of opening our next one with additional functionality and features. The new “Hugnet” should be coming in a few weeks, so please be sure to follow our GitHub repositories for the latest technical documentation. On October 17th, we hosted an engaging panel discussion on the topic of “Blockchain Solutions for a Changing World” for our community members in Paris. The panel featured Francois Stephan, a senior executive with Be-Bound, a mobile optimization company focused on bringing mobile and IoT coverage to 95% of the world’s population; Benjamin Clair, CEO of BetterChain, a startup that enables consumer-facing brands to find information about the origin of their products via a decentralized, blockchain-secured marketplace; and Romain Roy, founder and CEO of Greenweez, Europe’s leading online distribution platform for natural products. The debate was a thoughtful discussion of the enormous potential for blockchain to disrupt starkly different industries and change the way people exchange values around the world. Our CEO, Karim Ganem, also had the opportunity to present the audience with an update on IOV’s recent progress, and how IOV’s technologies would unlock the potential for blockchain to reach mass adoption. Following the panel discussion and presentation, IOV hosted a networking event that allowed our community of leaders and experts from industry, government and nonprofits to exchange ideas and discuss real-world applications of blockchain technology. 2018 was also a big year for forming new partnerships. Earlier this year, we announced IOV’s formal partnership with mobile network optimization expert, Be-Bound. Our partnership is a formal collaboration to design and deploy custom blockchain solutions for intervention in limited-infrastructure environments. Combining IOV’s technologies for custom, personalized addresses and atomic swaps with Be-Bound’s patented solution to expand the reach of mobile services pave the way for the development of blockchain applications that are tailored to low-connectivity settings. This is a critical partnership for IOV as we work towards our commitment to bring blockchain to the people, wherever they may be. Finally, we are happy to announce a partnership that we formalized in late December with Metacoin, a Hyperledger based ecosystem built by INBLOCK (inblock.co). Metacoin is built using Hyperledger Fabric technology, an open source consortium blockchain project led by the Linux Foundation and supported by companies like IBM, Hitachi, and Intel. Metacoin will be included in IOV’s Blockchain Communication Protocol (BCP) ecosystem, connecting it with other blockchains such as Lisk and Ethereum through atomic swap technology. As we look ahead towards 2019, we plan to build on this momentum and continue to add new blockchains to the BCP ecosystem.